Preprinted Christmas themed papers and stationery offer an affordable printing solution for fundraising, sales, marketing, social announcements, Christmas Parties, Holiday Parties, End of Year Parties, Winter Events and much more. 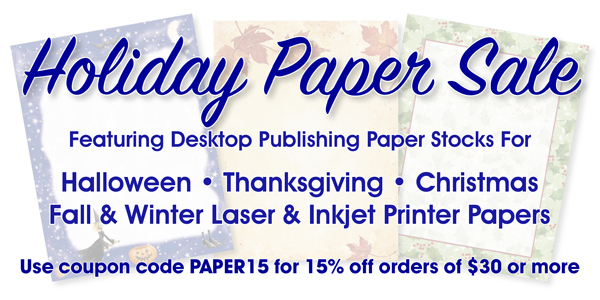 Our Christmas paper and holiday paper stocks are great for creating promotional pieces, making greeting cards, invitations, or announcements, using your favorite desktop publishing or word processing program, right from your computer. Simply design your item, then print as many, or as few, as needed with your ink jet printer or laser printer for a great looking full color piece without having to use expensive commercial printing presses or wasting tons of ink or toner in your printer. Check out our line of Christmas and winter related computer and printer paper stocks! Our 8.5" x 11" holiday themed computer printer paper is perfect for creating flyers or invitations to your next Christmas party, holiday gathering, end of year party, and much more. Our line of Christmas papers is there to help you design beautiful flyers and invitations. Our beautiful winter colored papers will stand out from the rest of the mail your client, families or friends get, bringing instant attention to your mailing. Whatever your needs this Christmas season, we have you covered!